On Monday night, the Cleveland Cavaliers defeated the Golden State Warriors to stave off elimination in the NBA Finals. The Cavs were led by historic performances from stars LeBron James and Kyrie Irving, who became the first set of teammates to score 40+ points in the same NBA Finals game. With the series now shifting back to “The Land” on Thursday night, can LeBron, Kyrie and the Cavs rally again to force a Game 7? While Golden State Warriors stars Stephen Curry and Klay Thompson have made major contributions to their team’s offense, it simply does not compare to the offensive influence of the Cavaliers’ most potent players. With both players scoring 41 points, the importance of Kyrie and LeBron to the Cavaliers was most evident during their historic performance in Game 5. That said, their value throughout the entire series has been tremendous, particularly on the offensive end — the two have combined to score or assist on 87.3% of the Cavaliers’ points this series (compared to 57.4% for the Warriors’ duo). And since the two blowouts to start this series, it looks like Kyrie in particular has started to figure out the Warriors’ defense. He often looks like the best player on the court, and has averaged a staggering 35 points per game in Games 3–5. On the flip side, while the Warriors system depends much less on their stars, the struggles of Steph and Klay have been critical so far. Both players only have 11 fast break points each, as the Warriors are not hitting their patented transition three-pointer. In addition, Klay has struggled creating shots for himself, with 78.1% of his field goals made being assisted. The fourth quarter is what really sets these players apart. Steph is shooting a blistering 57.1% on three pointers in the 4th Quarter this series. Klay has yet to get going, and is shooting an uncharacteristic 14.3% from three-point land in the 4th. The return and impact of Draymond Green will be critical to watch in Game 6. With Golden State’s defensive anchor missing from Game 5 due to suspension, the Cavaliers penetrated into the paint much more successfully than they had in the first four games of the Finals. The Warriors held the Cavs to 50.5% shooting in the paint in the first four games, but that mark rose to 60% in Game 5. No two players took advantage more than LeBron James and Kyrie Irving, who finished a combined 15–22 (68.2%) in the paint without Green’s rim protection waiting at the basket. A side effect of Green’s increased rim protection is the ability to more intensely close out the three-point line with less fear of giving up a layup if a Cavs player drives to the hoop. The Warriors’ three-point defense is more than 12% better with Green on the floor this series. 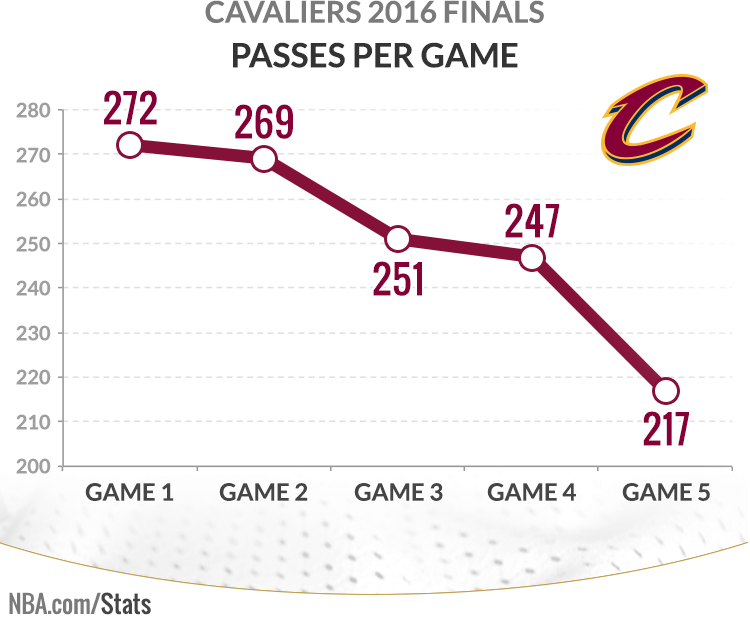 After averaging 279.5 passes per game in the first three rounds of the Playoffs (12–2 record), the Cavaliers’ ball movement has declined dramatically in the 2016 Finals. Through the first five games (2–3 record), the Cavs are averaging just 251.6 passes per game. There has even been a steady decline from the start of the series through Game 5. With fewer passes come fewer assists, as the Cavaliers have averaged just 17.0 assists on 38.0 made baskets per game (44.7% assist percentage) in the Finals. In the first three rounds of the playoffs, the Cavaliers assisted on 59.2% of their made baskets (22.9 assists on 38.7 baskets). Will this trend continue in Game 6? The Cavaliers rode two historic individual performances to a Game 5 win, but Cleveland remains two games away from completing their comeback from an initial 3–1 series hole. In Finals history, 32 teams have trailed 3–1 in the series and not a single one has come back to win the title. 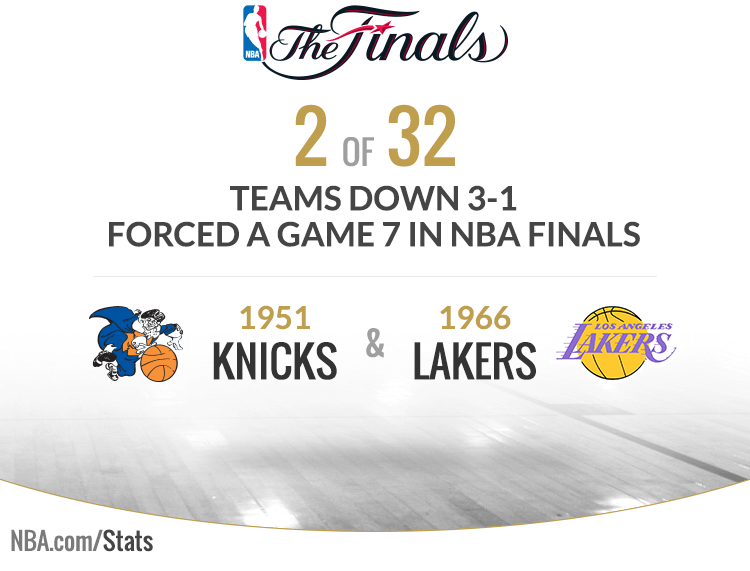 In fact, only two of those 32 teams even forced a Game 7 — and you have to go back 50 years to find the last time it happened. But to push this series to seven games, the Cavs first have to beat the Warriors in back-to-back games, which has happened only twice in the regular season and playoffs this year.